Thicker than our standard bully sticks, Barkworthies Double Cut Bully Sticks are a great way to give your dogs a chew they’re sure to love. These all-natural chews are naturally 100% digestible, making them a great alternative to a traditional rawhide. Dogs love the natural scent! 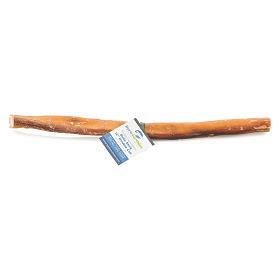 Thanks to their unique shape and texture, Barkworthies Double Cut Bully Sticks promote good dental health while helping prevent bad doggy breath. They’re made from free-range grass-fed Brazilian cattle. Please note that this product is not for human consumption. Please supervise your pet while giving a treat or chew. As with all of our products, Barkworthies are additive, chemical and preservative-free. Moreover, this is a single-ingredient product, which means they're 100% healthy and safe.